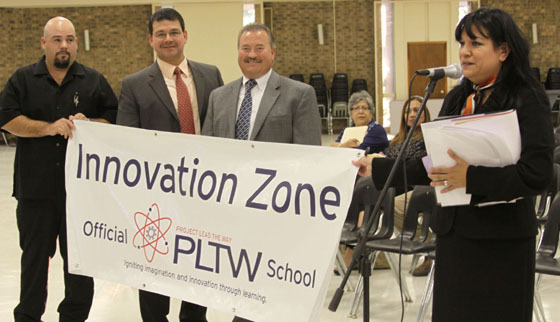 RGCCISD Receives Project Lead The Way Certification for STEM Education Program. Students from certified PLTW schools may receive college admissions preference, college credit, and scholarships at PLTW affiliate universities. Mrs. Adelina G. Villarreal CATE Director, announced today that it has received national certification for its Project Lead The Way (PLTW) program that has been offered since 2006. This is the second time the school has gone through the national certification process to validate its program. PLTW, a nonprofit organization and the nation’s leading provider of STEM (science, technology, engineering, and mathematics) education programs, offers a rigorous world-class curriculum that allows students to apply what they are learning in math and science class to real-life engineering and technology projects. PLTW also prides itself on high-quality professional development of its teachers and an engaged network of business, community and university partners to give students the fullest experience. The national PLTW recognition program distinguishes schools for successfully demonstrating a commitment to PLTW’s national standards. Additionally, certification as a PLTW school provides students with the opportunity to apply for college credit or receive college-level recognition at PLTW affiliate universities when they successfully complete select PLTW courses in high school. PLTW has more than 40 affiliate college and university partners including Rio Grande City High School and now Grulla High School. In order to remain competitive in the global economy, America needs approximately 400,000 STEM college graduates annually, according to a National Business Roundtable report. Currently, the U.S. is graduating only 265,000 annually. PLTW is providing students with the skills, foundation, and proven path to college and career success in STEM areas to increase the number of STEM graduates. Mr. Adolfo Pena, Jr., principal of Rio Grande City High School said, “We’ve seen how the PLTW program draws more students to engineering and technology courses and gets them thinking about college and their careers. We are extremely proud to be PLTW certified and ecstatic that our students are eligible for college-level recognition, which may include college credit for select PLTW courses, scholarships and admissions preference.” As part of the recognition process, Mr. Joel Trigo, Jr., Principal of Grulla High School, and a team composed of teachers, staff, students, and members of the community submitted a self- assessment of the school’s implementation of PLTW’s Pathway To Engineering (PTE) program. A site visit by a PLTW trained team followed. PLTW’s team met with teachers, school administrators, counselors, students, and members of the school’s Partnership Team. A PLTW school’s Partnership Team (sometimes referred to as an Advisory Council) is comprised of teachers, counselors, administrators, post-secondary representatives, business and industry professionals, and other community members who actively support the PLTW program within a school. “Both High Schools should be congratulated for demonstrating once again its commitment to PLTW’s quality standards,” said PLTW President and CEO Vince Bertram. “The real winners here, however, are the students. Students benefit from PLTW’s innovative, project-based curriculum that encourages creativity, problem solving, and critical thinking. We look forward to many more years of working together to prepare RGCCISD students to become the most innovative and productive in the world.” PLTW electronics engineer / teacher, Ana Cavazos added, “The beauty of PLTW courses is that our kids get to experience how a concept they learned in science applies to real-world projects, including robotics. Rather than sit passively and listen to a lecture, kids are building, developing, and creating. PLTW Manufacturing engineer/ teacher, Juan Andrade, Jr. stated, “It’s the kind of hands-on experience that will engage more students in science, technology, engineering and math—fields that they might otherwise never have considered.” RGCCISD sets policy by having any student enrolled in the pre-engineering classes in Grulla Middle School, Ringgold Middle School or Veterans Middle School receive high school credit when graduating to High School. Students enrolled in the CATE classes with the career cluster for engineering receive articulated credit @ UT, Tyler, Texas.